Renewable energy companies are looking to this big, sunny state as the next frontier for solar power. But solar is expensive, and once again the Legislature did not pass a statewide solar incentive. Some companies and communities are forging ahead nonetheless. Corky Hilliard mounted 19 solar panels atop her Austin home last month — and expects to pay only about a quarter of the initial cost estimate for the array. "My God, I mean, why wouldn't you do this?" said Hilliard, whose neighbors on both sides have also added rooftop panels. For many Texans, there actually is good reason not to go with a solar option: Generous local incentives that allow Hilliard to pay less than $4,500 for the panels, which are projected to produce the equivalent of about two-fifths of her electricity use, do not exist in most of the state. Environmentalists had hoped that Texas lawmakers would pass a bill this session sponsored by State Rep. Drew Darby, R-San Angelo, to establish a statewide rebate for solar projects. It would be funded by extra charges on electric bills, including a $1 per month fee for residential ratepayers. But the bill died without getting out of a House committee. Texas prides itself in being the national leader on wind power, and many renewable energy companies are looking to this big, sunny state as the next frontier for solar power, which California currently dominates. Solar could work well for the Texas electric grid because it produces power during the daytime, which correlates to the time when air-conditioners are blasting. "The opportunity in Texas for solar energy is massive," said Scott Franklin, the founder of Colorado-based Lighthouse Solar, which installed Hilliard's system. But unlike California, Texas has no statewide solar incentive. This means that for most Texans, solar technology remains out of reach: Notwithstanding its environmental benefits, it can be twice as costly as coal or gas power on a nationwide basis before incentives. The recent fall in natural gas prices has made it especially hard for solar to compete (although panel prices are coming down too), and Darby's bill ran into cost concerns from the Texas Public Policy Foundation, a conservative think tank, and some lawmakers. "I don't really want to explain to my mother why she's got another dollar on her bill," said Rep. Byron Cook, R-Corsicana and chairman of the House State Affairs Committee, during an April hearing. Luke Bellsnyder, executive director of the Texas Association of Manufacturers, said his members had made peace with Darby's bill, which would have added $50 per industrial meter per month. "We agreed not to oppose the bill moving forward," he said. "But I think others in the Legislature did not think this was the appropriate time to increase electric rates from one product line." A raft of solar incentive bills also died during the 2009 session. Nonetheless, some large solar projects are emerging in Texas. Last month a developer started building a 30-megawatt solar facility in Webberville, a small community near Austin. It should be completed later this year, and the power will be sold to Austin Energy. San Antonio, widely viewed as the Texas city that's most aggressively pursuing solar, began getting power from a 14-megawatt solar farm last November. (This appears to have been largely responsible for Texas' top-10 place in an industry group's ranking of states that added the most solar power in 2010.) Details of a second solar project planned by San Antonio's utility, CPS Energy, totaling 30 megawatts, are being finalized. CPS Energy also recently sought proposals for another 50-plus megawatts large solar projects; the short list of companies that may be selected to build the projects may be published within a week, spokeswoman Lisa Lewis said on Wednesday. A 60-megawatt solar farm has been proposed for the outskirts of Pflugerville, and "pre-construction" work has been done at the site. The developer, RRE Austin Solar, is now waiting until it hears whether Austin Energy or another entity will buy its power. The company has received substantial incentives from the city of Pflugerville, Elgin Independent School District and Travis County. If it gets built, a "solar incubator" is also envisioned for the site, to nurture start-ups and allow them to test their equipment on the solar farm. Experts say that the best solar potential lies in West Texas, which has little cloud cover. Randy Sowell, the McCamey-based land manager for Fremantle Energy, a renewable energy developer, said transmission lines being built by the state to aid wind power could also benefit solar. He predicts that projects in the large enough to supply utilities could be started in a few years in the Trans-Pecos region. It will be important, Sowell said, to site solar farms in places unlikely to see much oil and gas drilling — or at least to make sure that the land is not so covered in solar arrays that the mineral-rights owners cannot access it. However, a large solar array planned for the Marfa area stalled last year, although the Big Bend Sentinel reported in March that solar efforts continue at Marfa, as well as at another site near Presidio. For both large and small projects, incentives can make a big difference. Hilliard's installer quoted her a total cost of $19,190, before fees and taxes. But an Austin Energy rebate reduced that amount by nearly $11,000. Another local rebate (from a smart-grid group called the Pecan Street Project, which began offering solar incentives in April) and a federal tax credit cut it further, to the final $4,438 estimate. Oncor, the electric poles-and-wires utility serving the Dallas area, will begin taking applications for a new round of solar incentives on Monday. A similar round last year sold out in a month. Laura Spanjian, Houston's sustainability director, said that Houston has asked Centerpoint, the local poles-and-wires utility, to provide solar incentives, and "they are thinking about it." 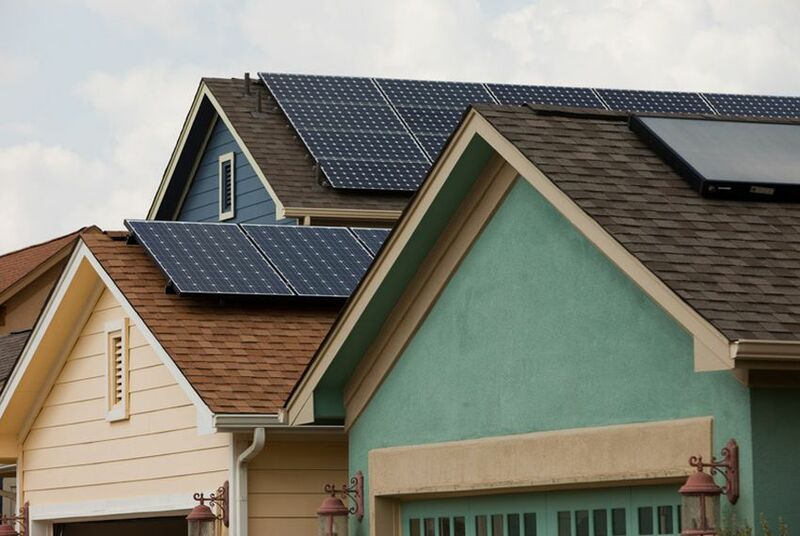 Electric utilities in El Paso and San Antonio also offer residential solar incentives. Intriguingly, getting solar panels installed in Texas is cheaper than in any other state, according to a report last December from the Lawrence Berkeley National Laboratory. The reason, apparently, is that the scattered solar incentives that do exist in Texas are unusually generous. If the Texas solar market got going, some solar advocates argue that it will be easier to attract solar manufacturers — and jobs. San Antonio has encouraged developers to include mechanisms for attracting solar manufacturers in their recent solar proposals. It bears noting, however, that the entire country is struggling to attract or keep solar manufacturers, given the intense competition from Asia. Bellsnyder, of the manufacturers' group, said that even Darby's bill might not have brought manufacturers. "Oftentimes these solar measures are sold as a way to bring manufacturers, but I'm not sure that's completely honest," he said. Two solar bills did pass this session and await action by the governor. One will make it somewhat harder for homeowners' association to bar solar panels. Another clears regulatory hurdles to solar leasing and other third-party ownership arrangements, which for tax reasons will be helpful to schools and churches, according to Luke Metzger, executive director of Environment Texas. A proposal to require Texas to add 500 megawatts of non-wind renewable energy is pending at the Public Utility Commission, which will probably discuss how to proceed in the coming months, said its spokesman, Terry Hadley. Gov. Rick Perry, who appoints the PUC commissioners, indicated during the session that he would oppose a bill, sponsored by Rep. Rafael Anchia, D-Dallas, that would have created this type of incentive, according to the Austin American-Statesman. When asked the governor's position on non-wind renewables requirement, spokeswoman Lucy Nashed said Perry "expects the PUC to act in the best interest of Texans, and he continues to support a diverse energy portfolio that allows all types of energy providers to compete in the marketplace without imposing burdensome and costly mandates." There is one piece of history, however, that's worth considering. Perry has said he's thinking about a presidential run. And if his administration were to approve a clean-energy incentive — a issue with some degree of bipartisan support around the country — it wouldn't be the first time a Texas governor has done so before running for president. Another governor, George W. Bush, signed SB 7, the bill that created, among other things, a renewable energy requirement, thus launching Texas' wind revolution, on June 18, 1999. That was six days after he declared he would enter the presidential race.